Nurse Practitioner with extensive experience providing care to high risk neonates in inpatient hospital setting. Provide delivery room attendance and stabilization as well as management of infants in the NICU at St. Francis Hospital. Large NNP group covering one level III neonatal intensive care unit and one level II special care nursery within the state of Delaware; this includes attendance at high risk deliveries as well as air and land transport of neonates. NNP in group practice covering one level III neonatal intensive care unit. Currently on the moonlighting staff. NNP in group practice covering two level III neonatal intensive care units and one level. I nursery providing delivery room stabilization of all high risk infants including. Community hospital with level III NICU; attended high risk deliveries and management of. neonates in 10 bed NICU. 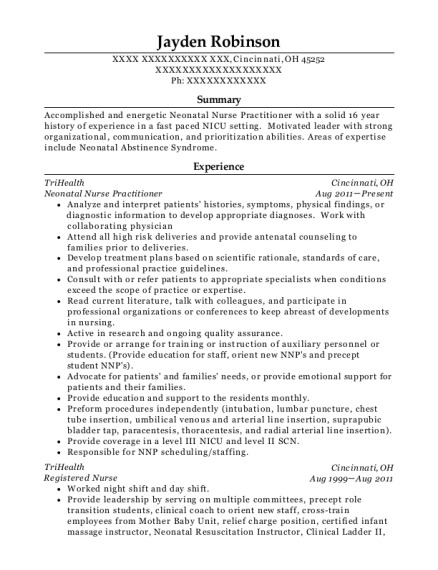 Staff nurse in level III NICU; attended high risk deliveries and accompanied physicians. Various staff positions in large urban hospital including ICU, CCU, cardiac surgical. ICU, NICU, postpartum and high risk antepartum units. Responsibilities included classroom lecture and clinical supervision of nursing students in labor and delivery and pediatrics. Staff nurse in level III 25 bed NICU; involved in attending high risk deliveries and accompanying neonates via ambulance and fixed wing transport. Evening charge nurse on thoracic surgery floor for one year and then staff nurse in adult ICU. 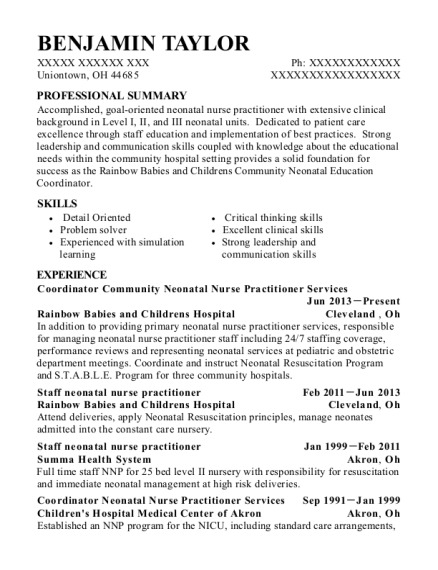 This is a resume for a Neonatal Nurse Practitioner in Newark, Delaware with experience working for such companies as Nemours and Christiana Care Health Services. 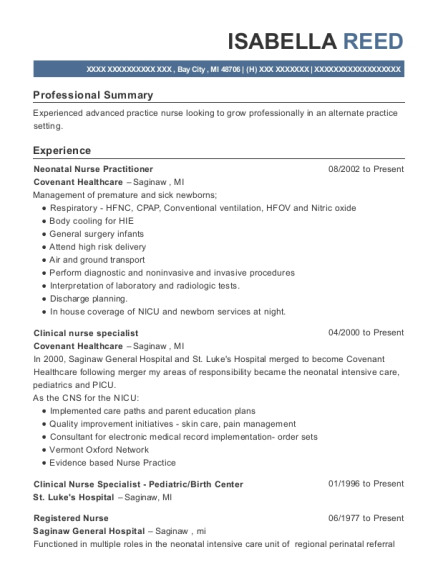 The grade for this resume is 0 and is one of hundreds of Neonatal Nurse Practitioner resumes available on our site for free. 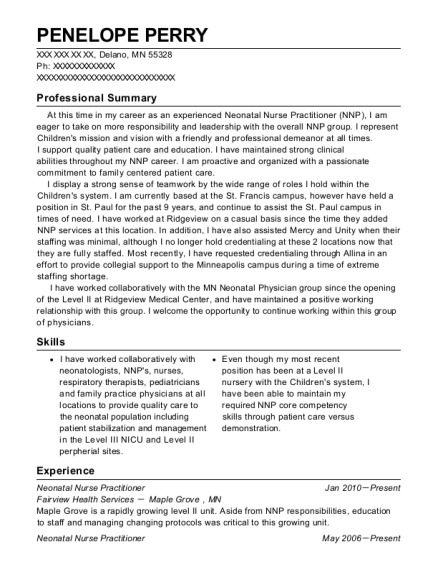 Use these resumes as templates to get help creating the best Neonatal Nurse Practitioner resume.